he Third Eye Chakra. Intuition, Insight And The Best Essential Oils To Use. Have you ever been thinking about a friend you haven't seen for ages....and then you suddenly get a phone call from them? Have you ever experienced a pyschic moment? Do you sometimes follow your 'gut instincts', your intuition, and wonder why? This is what the sixth energy centre deals with. Ajna, sometimes known as the brow chakra, is located in the brain, behind the eyebrows, and is our centre of intuition and wisdom. It governs both our conscious and subconscious minds and is all about our purpose in life. It is often referred to as the mind centre. This sixth chakra is linked to the pituitary and pineal gland and is associated with the face, parts of the brain and central nervous system.....and all the senses. It deals with imagination, intuition, pyschic powers, insight and perception......it is our 'sixth sense'. It is about learning from our experiences and separating reality from fantasy. It is linked to forgiveness and equanamity. In Sanskrit Ajna means 'command' or 'management'. A balanced sixth chakra helps you feel in control of your life and and be able to sense beyond the physical world. When this chakra is aligned it promotes heightened intuition, pyschic abilities and a detached perception. When it is out of balance you may fear success and set your ambitions and goals too low. You may lack discipline, be overly logical and not open to imaginative ideas. You may find it hard to visualise anything....even dreams. Too much energy flowing through this chakra and you may experience too much pyschic information, nightmares and hallucinations. Is Your Third Eye Chakra in Balance? Headaches, problems with the nervous system, mental issues, problems with eyes, learning disabilities, nightmares. Excessive worrying and anxiety, poor judgement, a warped concept of reality, confusion, lack of concentration. 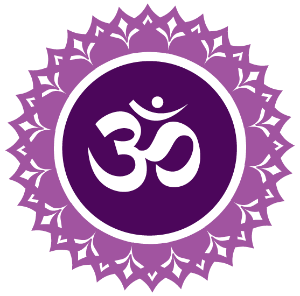 The best essential oils to use with the third eye chakra are ones that are used in meditation and rituals, and ones that have the highest energetic frequency. Also ones that help sort out head, eye and sinus problems. Rose, neroli, frankincense, sandalwood, jasmine, elemi, lavender and melissa - oils often used for meditation and in rituals. Tea tree, lemon, geranium, chamomile, rose and clary sage - all help with eye problems. Lavender, tea tree, eucalyptus, jasmine, peppermint, melissa, chamomile, marjoram and rosemary - excellent essential oils for headaches and migraines when used as a cold compress laid over the forehead and eyes. Remember, Lavender is useful for all seven main chakras. It is especially good for soothing headaches and migraines - rub directly onto the temples.